A fleet 1st, 2nd and 3rd. Please let Weyman know your votes for most improved and most inspirational sailors for 2015. All racers and guests are invited. Please let Weyman know ASAP how many in your party will be attending. Also, for those of you who have CalCup trophies from past seasons, please bring them to the event so that they can be engraved for the 2015 series. We're on for the CalCup End of Season Party and Awards Banquet this Saturday November 23. The bar opens at 6pm and dinner will be served at 7pm. The CalCup end of season party will be held on Saturday November 23 at the Berkeley Yacht Club from 6pm to 10pm. Please RSVP kitparts@me.com so that Mike can let the club know approximate #s. thanks! We're "on" for CalCup racing in conjunction with the America's Cup this Saturday August 24! Please click here for the NOR, more details about the logistics, and the course map. Each complete package will be available for sale for $1,499.00 after Nationals (retails for $2,549). Shipping can be arranged for $160 flat rate. Orders for charter boards should be made directly to Josh Shirley of Trident Sports at josh@tridentsports.com. Only a limited number will be made available so order early. The CalCup end of season party will be held on Saturday November 10 at the Berkeley Yacht Club from 6pm to 10pm. Dinner will be $15 per person. Please RSVP kitparts@me.com so that Mike can let the club know approximate #s. thanks! As excited as we are to make this announcement, we do know that some of you have already changed travel plans due to our cancellation notice that went out just a few days ago. We are so sorry for the confusion of the changing situation and the travel arrangement troubles that may have been caused. Everyone involved is working hard to make sure that the event will be fantastic and we hope to see you all there! Head AWT judge Matt Pritchard says "The US Nationals are the backbone of racing in the USA! We need to keep the flame alive and do everything we can to save the Nationals for 2012!" And remember, the summer calendar is packed with other great events also. The Formula North American Championships will take place in San Francisco from July 17-22, San Carlos Cactus Cup Wave Contest is in San Carlos, Mexico from July 28-August 4, The Techno 293 Nationals/Kona New England Championships/RS:X East Coast Championships in Martha's Vineyard from July 31-August 2 and the Kona North American Championships in Waconia, MN from August 24-28. Some important changes to the CalCup rules for 2012: If racing is canceled for any reason on the scheduled Saturday date, the racing will be re-run the very next day (Sunday) that same weekend. If the whole weekend (Saturday and Sunday) ends up as a DNR (Did Not Race), that event will NOT be re-scheduled at a later date. There are no make up dates. Please review this new rule (#14) and the rest of the CalCup racing rules here. The third and final Youth Regatta of the season went off at the Berkeley Marina this Sunday 10/2/11. Click here for the Regatta report and race results. And click here for the photos. That wraps up the season. Please check out the final season standings here . The votes are in, and the overwhelming majority preferred the shared party with the St. Francis on the 7th. So, the 2011 CalCup end of season awards party will be held on Fri, Oct 7, 2011 at 6:00 PM WHERE: St. Francis Yacht Club On the Marina San Francisco CA 94123. Mike still needs some of your trophies from last season back! The second Youth Regatta of the season went off at the Berkeley Marina this Sunday (9/11/11). Click here for the Regatta report and race results. And click here for the photos. The first Youth Regatta of the season went off at the Berkeley Marina this Saturday (8/27/11). Click here for the Regatta report and race results. DoubleTree by Hilton At Berkeley Marina Signs As 2011 US Windsurfing Nationals Title Sponsor. Local racer Weyman Lundquist is starting a series of Learn To Windsurf clinics aimed at 11-14 year olds. The clinics are aimed at taking the junior participants from entry level skills to racing on the national level. Click here for all of the details. The 2011 CalCup, West Coast, and USW NRT Calendars are now online. Great news from Karen Marriot, the president of US Windsurfing! "Hi All, First, big news…….The Berkeley Yacht Club board of directors just voted last night and decided to host the 2011 US Windsurfing Nationals! Jane Morson, who has done lots of work with running Formula races and the Cal Cup in the Bay Area, will be the main organizer and I am confident that she will do a fantastic job! The dates are July 11-16, which is before the Techno 293 worlds at St Francis – so we are hoping that some of the international kids (and our US kids) who come to that will come to Nationals as a warm-up regatta. So start spreading the word so folks can be making their plans to travel to the “warm side” of the bay for next summer’s nationals! Karen"
The first inaugural Friday Night 'Beer Can' Race will be held at BYC on the 17th of September. Click this link for all of the details. 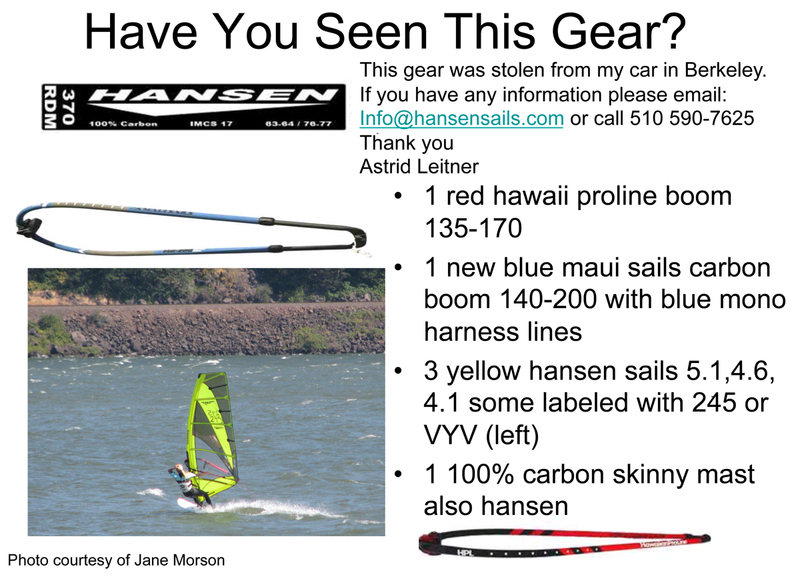 Astrid Leitner had her windsurfing gear stolen from her car (Berkeley, CA). Please keep an eye out for this gear! Click this link to see the flyer. We'd like to thank the following people who generously donated their time and energy this season! Sonya Schoenberger, and her Mother and Sister. At long last we can announce our end of season awards party! Date: Saturday, 7th November 2009 Time: 6pm - 10pm Location: Pomegranate Restaurant, 1585 University Ave, Berkeley, CA 94703. This no longer a ‘pot luck event, but instead every guest is responsible for their own tab for food and drinks. Please contact info@calcupevents.com, ASAP, if you will attend this new venue, and with your number of guests attending. We look forward to seeing you all at the 2009 party. The final 2009 season results for CalCup and the StFYC Friday Night Series have been posted to the results area. The SF Classic & UN Challenge Results are now available. Elvstrom-Zellerbach Regatta: racing photos by Arnaud Lepert, awards presentation photos by Melanie Roberts. Photos from the first Calcup race of 2009 courtesy of David Wells. This year we are trying something different. We will have a BBQ & 'pot luck' at BYC, for our end of year party. Please contact Jane at info@calcupevents.com for further information and to let us know how many people will be in your party, and what dishes you will be bringing. (If you are not sure what to bring we can let you know if there is anything particular we need.) We will post any updated party information as we get nearer the date Please RSVP. It will help us a lot. Plus we do have a number capacity we can not exceed. The final CalCup race of the 2008 season was held this weekend (9/6/08) at Berkeley. The results for the last race and the Final 2008 series standings for CalCup are now posted. Thanks to everyone who joined us for racing, the awesome clinics, and race committee this season; and congratulations to all of the division winners! We hope to see all of you at the end of season party which will be announced shortly. The CalCup and St. FYC Junior program get a mention on the U.S. Junior Windsurfing Newsletter. Thanks to everyone who attended the August 2 CalCup and drove to 2 separate venues. First to Alameda for no wind, and then to Coyote Point for too much wind! The conditions and some technical difficulties with the boat and drifting marks prevented us from holding any races. Click here to check out some photos of the day, an interview with Ben Bamer of F4 Formula Fins, and an inside look as to why we didn't have any racing on Saturday. Former SF Bay local Fernando Martinez is the Men's 2008 US Windsurfing National Champion. Australian Pro Allison Shreeve won the Women's title. The CalCup race committee and our rules judge have approved a change to a new scoring program. This new program (JavaScore) implements and automates the scoring by using the ISAF low point 2005-2008 scoring rules. This is the same program that a lot of Professional organizing committees (including the St. FYC) use. The only change you will notice is that 1st place will no longer earn you 0.75 points, and will instead earn you 1 point. The scoring change will be implemented effective immediately, and will also be retroactively applied to the first CalCup race of this season so that we have uniform scoring for this season. The CalCup Rules on the web site have also been changed to reflect this change. CalCup Quiz #1: Can you guess the race venue pictured here? Correct answers will be raffled for free entry to the CalCup race of your choice. Meet the Designer, and support a great cause. Join us for an evening with Bill Hansen of Hansen Sails, in a fundraiser for Cal Sailing Club. The CalCup end of season party is being held on Saturday October 27 at Skates on the Bay, at the Berkeley Marina. Skates have composed a delightful menu for us at $30 plus tax and gratuity (drinks are not included). There is also a stupendous children's menu (under 12 years of age) at $7.00. We will meet in the bar area before 8pm for cocktails, going into our dining area at 8.30 pm. Please RSVP at: info@calcupevents.com , by October 8. Announcing the 2007 Hansen Sails Formula HCL™ Race Sails. Read the full Press Release. The 2007 CalCup photo gallery section has some new additions. The 2007 USWA Nationals and Formula North Americans are now complete. Be sure to check the Official National's Blog for all of the results, photos, press coverage, and podcasts. NOTICE EVENT POSTPONED: Due to weather difficulties, the 2007 Canadian Windsurfing Slalom Championships will be postponed until a later date. The Official Web Site for the 2007 USW Nationals & Formula North American Championships is now live. The Official NOR for the 2007 USW Nationals & Formula North American Championships hosted by the St.FYC is now available. New race event in SoCal: Cabrillo Beach Windsurf Enduro. A new year, a new board... MikesLab has a new formula board: The L7 is a registered production race board with the ISAF. Awesome windsurfing videos on MyHuck.com ...plus upload your own! Excellent Midwinters report from Steve Bodner on his new blog. The Calema Midwinters results are in, and the Bay Area contingent put up some impressive numbers in their respective divisions: Mike Percey 2nd, Steve Sylvester 3rd, Steve Bodner and Fernando Martinez tied for 3rd. Treasure Island access threatened! See how you can help!!! 2007 HIGHLAND SPRING HIHO ADDS OPEN CLASS RACING New challenge for top level racers with St Maarten start: Press Release. Check out the Windsurfing Magazine article on the new Hansen HCL™ sails! Check out the new History of Hansen Sails article in the latest issue of Bay Crossings Magazine. Hansen Sails, LLC is pleased to introduce the new Hansen Compliant Leech technology (HCL™). Read the latest CalCup article in the September issue of Bay Crossings magazine. And then read the 2nd CalCup article from the same issue (both with photos...). The StFYC has asked CalCup to join them for this year's End of Season Party. So the CalCup Party will be held in conjunction with the StFYC Windsurfing End of Year Party at StFYC on the evening of Saturday 14th October. Some photos from the the 2006 Bridge to Bridge Race. Mike Percey sailing on the new Hansen Sails at the SF Speed Event. Check out the recent article about CalCup in BayCrossings magazine!! ...and Mike Percey made the cover of the July 2006 issue! In the great tradition of 24 hour races in other sports (auto racing, Mt. Bike racing, etc. ), here is a report from a 24 hour windsurfing race. The first ever San Francisco speed event was held June 15-18. Check out the Official Event Web Site, Event Information Flyer, NOR, Some Photos, event report/photos by David Fielder, and Results. US Open Regatta Report from Steve Bodner. 600 racers at Defi Wind 2006. Formula World Championships Regatta Report from Steve Bodner. - Day one Results. How windy was it? - Steve Bodner's Race Report. - Bill Weir's Race Report. Daily updates, interviews, soundbytes, photos, etc. from the 2005 US Windsurfing National Championships. Did you Slalom Race at StFYC on Saturday 11th June or at BWS on Wednesday 15th June? Whether you raced or not you should check out this amazing video clip made by Brian MacDougall. Listen to Mike Percey's Radio Interview where he talks about windsurfing, racing, and CalCup. SFBA End of Season Party Saturday September 24 8pm - 1am at Kelly's Mission Rock. Shark Sandwich will be playing from 9pm - 1am. Observations From A Slalom Racing Newbie: Check out this interesting report written by David Fielder about his experience of the BWS races from a racing novice's point of view. From the archives: check out some vintage race results. See anyone you know? Official web site of the 2005 US Windsurfing National Championships currently being held in Hood River, Oregon. Check out these 2 pictures from our CalCup Races at Pt. Isabel on June 25. These are just a taste of what is to come so please 'watch this space' :) ! We would like to take this opportunity of thanking Anders for taking the photographs. A message from Janet Baxter, President of US Sailing, for all of you going to the US Nationals in the Gorge this summer! If there is no wind for the BWS Slalom Races, this event will now switch to a Formula Race on the new BWS Formula Course! The 'Three Berkeley Musketeers' bring home the awards from Texas! Racing in Brazil with CalCup Racers! What does a windsurfing race with 456 boards starting look like? Could this be a CalCup race of the future? The wednesday night Berkeley Windsurfing Race Series starts wednesday 5-25-05! Changes to the Racing Rules of Sailing for 2005-2008. Calema Midwinters 2005 Report from Mike Percey.